Why does it matter whether a bush flowers on new or old wood? In a word, pruning. Once you've determined that a shrub blooms on the previous year's growth, you know that the correct time to prune it is immediately after it finishes blooming. 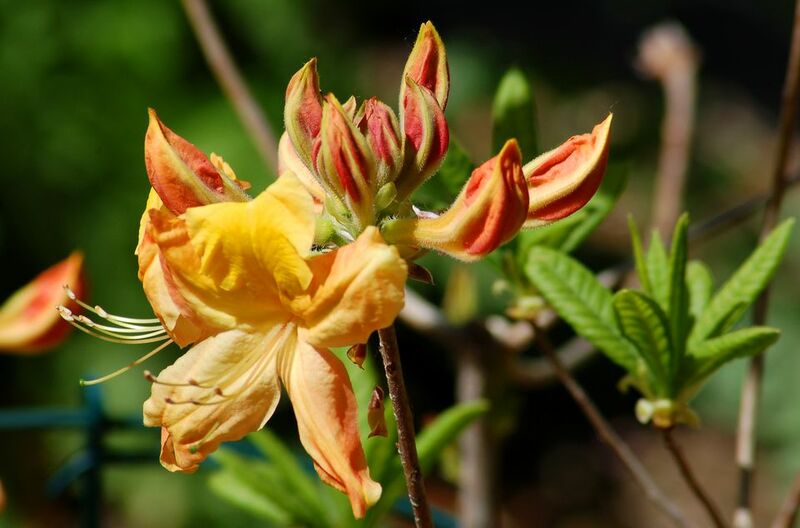 Shrubs that bloom in spring flower on old wood and should be pruned just after those blooms fade. They need to be left alone to put on growth during the summer and set bud for the following spring. If you prune too late, you miss out on some or all flowering next year. Shrubs that bloom in summer flower on new wood (produced during the current year's spring season). They are often pruned in late winter or very early spring. This still gives them most or all of the spring to put on growth and set the buds that, come summer, will become flowers. Note that, in some genera, not every species can be pigeonholed into the same category. Thus, as I explain in my article, Shrubs That Bloom on New Wood, you have to consider hydrangeas and spireas on a case by case basis. That is, you can't say that all hydrangeas flower on new wood or that all spireas bloom on old growth. Marie Iannotti points to a similar situation with roses, making it difficult to generalize about optimal pruning times. Interestingly, some types of hydrangeas fall into both categories; they are called "reblooming hydrangeas." Note also that the advice to prune bushes that bloom on last year's growth immediately after they finish flowering is a case of, Do as I say, not as I do. By no means am I always so punctual in performing my landscaping chores. Besides, "immediately" is a harsh word for someone juggling a career, family, social commitments, health issues, and, yes, landscape maintenance. Is there a grace period for pruning? Mercifully, there is. In her book, Caring for Perennials (p.37), Janet Macunovich helps us calculate the grace period: "Give the plant three months of good growing between the time you cut it and when you expect to see it bloom" (although months during which the plant will be dormant don't count). She uses forsythia as an example. This bush blooms in April and starts going by in early May. Let's say you don't get around to pruning it until early June. Will it still blossom next April? Macunovich assures us that it will, citing the fact that the bush still has "part of June, all of July and August, and at least a little of September" to finish growing and set bud (p.38). I'll list my entries in roughly chronological order (i.e., earliest flowers first). Note that a shrub's inclusion on this list doesn't mean that you necessarily have to prune it every year, but only that, if you do choose to prune it, the ideal time to do so is right after it is done flowering. I have focused on bushes with showy flowering displays, as opposed to plants that, while technically part of the "flowering shrubs" category, are more often grown for a feature (for example, Japanese barberry for its foliage or red twig dogwood for its bark) other than its flowers. Now that you know more about when to prune, perhaps you could use some tips on technique. If so, read this article about pruning shrubs.